We were checking out the magazine rack today and noticed a new publication that looked very similar to RECOIL and for good reason. For all those FNH fans out their or just firearms in general, FNH USA in collaboration with RECOIL have put out a complete magazine dedicated to the firearms manufacturer. While it may come off as a huge advertisement to FNH USA, the magazine is packed with content from the history of company and their products to discussions on their current shooting team. Of course there is plenty of focus on their latest pistols, shotguns, and rifles and pleasantly no car ads. A "first look" is provided of the Ballista Precision Rifle. They also throw in a target as typical with RECOIL, so there is that bonus. 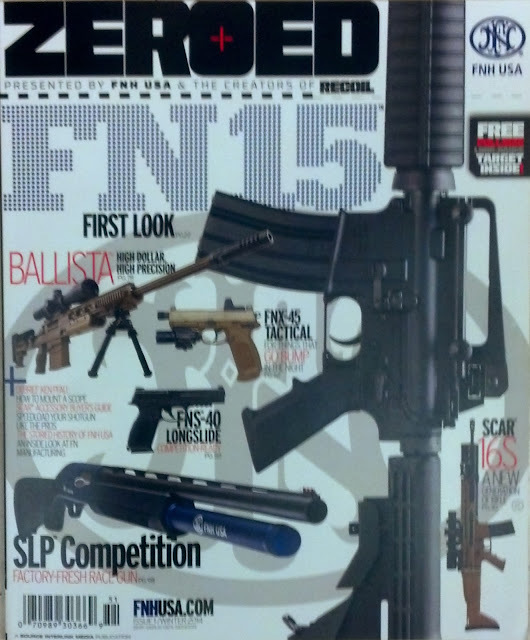 We saw ours at Safeway, so we imagine you can find them in most magazine racks that feature RECOIL.